In my previous post, Mastering the SAT Essay – Part 1 , we talked about the importance of planning what you’re going to write before you begin your essay. Did you try it for yourself? If so, take out your notes and look back at them as we go through each step in the process. I am going to agree. I personally believe that’s it’s important to question the ideas and decisions of people in authority. Because I believe it, I’ll have an easier time making my case. I think of brainstorming as using a flashlight to look for your keys in a dark room. If you’re waving your flashlight all over the place, it’s going to take you longer to find your keys than it would if you had a plan for where to look. You wouldn’t waste your time shining your flashlight on the wall or the ceiling. You want to be systematic and narrow your focus. 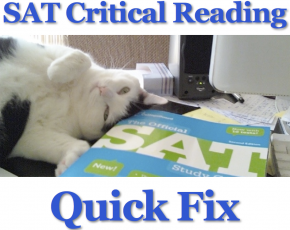 It says on the SAT to support your position with examples from your reading, studies, experience, or observations. When I go through the categories one by one, this is what I come up with. There are many other examples you could use here. I chose these because each of them is commonly read in high school English classes. You should start by thinking of the books you’ve read in the past couple of years. If you have the “Official SAT Study Guide,” you might want to flip through all of the essay questions and notice how the books I picked here could be used as examples for many of the essay questions you might see. History: I come up with Martin Luther King, Gandhi, Jesus, and Hitler. There are many other historical figures you could use. I chose these because you probably know something about them. Just as with the books, you should start by thinking of common, obvious figures whom you know something about. Also, as with the books, if you flip through the other essay questions you’ll notice that each of these examples can be used to answer many of the essay questions you might see. Current events: Depending on your point of view, you might use either of our two most recent Presidents. There are other examples you could use in this category, too. People I know & my own experiences: I won’t go into the last two categories, mostly because I’ve got some great examples already. However, if you’re having trouble coming up with examples, you should feel free to use these categories. A personal story can be especially relevant and compelling. You should also feel free to make up a story as a last resort, but remember that the devil is in the details. The most common problem I see students run into when they make up a story is that they don’t have enough relevant details to support their argument. If you’re making up a story, it has to be solid. Every example I’ve listed can be used to write a great essay. I’m going to pick Huck Finn and MLK, for 2 reasons. First, I know them pretty well, which is a criteria you should also use when picking your examples. Second, I can relate them both to a single issue, race. One addresses the issue of race from a fictional standpoint, the other from a historical standpoint. I don’t mean to suggest that race is a particularly good issue to address, just that if you can find two examples that relate to the same thing in different ways, it can give your essay an added boost. I have good examples, so I’ll skip this step. If I were going to take the other side, though, I could use some of the same books, at least one of the historical examples, and plenty of current events. It’s important to question authority because doing so creates progress and moves society forward. I mean very short. This is just to keep you on track, so you don’t meander while writing. Think of it as the directions for your essay. The whole brainstorming process should take 5 minutes. When you’re done, you know that you’re going to write 4 paragraphs, and each paragraph will be about one thing and one thing only. That leaves you 20 minutes to write your essay. Once you know what you’re writing about, the actual writing always goes much more smoothly. 1) The third paragraph should begin with a sentence that transitions your essay from the first example to the second. The racial tensions explored by Mark Twain in 1884 came to a head 80 years later when Martin Luther King led his march on Washington. That’s just one possible way to go. There are many different sentences that could join those examples, just as many different essays could be written from the short outline I’ve just shared with you. 2) Your last paragraph is your conclusion. It should be just a sentence or two that ties everything up and restates your argument in slightly different words. Essentially, you want to say, “As you can see, I’ve proved my point.” Don’t add anything new. That’s it. Now you’re ready to write an essay. If you have the “Official SAT Study Guide,” you can compare your essay to the samples provided on the College Board website. Try it and let me know how it works. I am taking the SAT for the first and last time tomorrow! Let me just say, out of all of the tips that I have read recently, yours is by the far the most comprehensive and informative. Although I am still a bit nervous, your information and tips have calmed me down so much. Thank you for helping me and many others prepare to take the SAT. I have been taking 2 practice tests a day for about 2 weeks and my scores have been annoyingly constant, and not as high as I want. If my scores go up when I take this tomorrow, I am going to give you some of the credit. I feel much more confident than I did waking up this morning on the final day before the big test. Thank you so much for everything! You’re welcome, Shelby, and thank you for your kind words. I’d love to know how it goes for you. A typo, obviously, not a grammar error, but thanks for pointing it out. That’s a good question, and I have to admit that I’m not sure. The College Board says it doesn’t matter what you write about, but the graders are just regular people who have their own experiences, knowledge, and opinions which can’t help but factor into their assessment of your essay. For example, I tell my students that it would be a bad idea to say that teachers are stupid, because all of the test graders are teachers. In the end, though, you have to write about what you’re comfortable writing about. Don’t choose examples that you don’t know well because the test grader will know them better than the ones you would choose naturally. I’m almost certain that will backfire on you. In other words, be true to yourself. Good luck. It sounds like you’ll do great! I’m not quite sure what you mean. If my answers to the other questions don’t help you, please write back with a more specific question. And good luck! Thanks for the note. It’s a good question that you ask. I don’t know any other languages well enough to write an essay in them, so I can only give you my educated guess about what I would do if I were in your position. If I were you, I would do all the brainstorming in my native language. Use your own experiences and your own language to come up with examples, narrow them down, and write a short thesis statement for your essay. Then, translate it into English. My last tip is that if you can use the story of why you want to leave your native country to attend college in the US, if that fits in any way with the essay topic, it will probably help you to write the best essay you can. The reason is that you know that story really well, so just pretend like you’re telling it to a friend. I hope that helps. Let me know what happens. Thanks for your precious experience. Because I am not native, it takes me so long to think many examples in English. Can you offer me any suggestions? this is the best articles have read on sat essay thank.